Welcome to our Long Island Kids Birthday Party Guide. Every Parent wants to give their Child a great Party and budget is always a key factor! We have a comprehensive list of party suppliers and providers to help you create the perfect day for your little one on any size budget! We have conveniently divided the LI Party Guide into two main sections: Party Activities & Themes in Nassau County and Party Activities & Themes in Suffolk County. When planning your child’s special day, you need information fast and near to you. Whether you need a kids birthday party theme in Nassau or a kids birthday party theme in Suffolk, we can point you in the right direction. Children’s party themes create a fun atmosphere for all the kids attending the party. Whether you want a clown or a princess, one of the party themes ideas for kids will fit what you are looking for. Trying to think of birthday party themes for kids can be exhausting, that’s why we have a convenient list of party themes for kids of all ages. You might choose Halloween party themes for kids if the party is in October. Summer is also a great time to have a pool party theme. Popular kids party themes can always be adapted to suit exactly what your child wants. Children party themes open up a whole new world of ideas for your child’s party. Party themes for children are a great way to celebrate a birthday on Long Island! Ideas for kids birthday parties can sometimes be hard to think of every year. 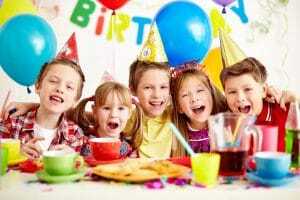 That’s why we provide you with a list of kids birthday party ideas from which you can choose. A child’s tea party might work well if your daughter likes to entertain and be a little hostess, but there are also other children party ideas from which you can choose. In summer time, kids pool parties are always very popular. Child party ideas can liven up a dull or slow party and turn it into hours of fun. Child Halloween party ideas will give you lots to think about like carving pumpkins, making costumes and so on. Kids party entertainment ideas will make your party into a fun afternoon for everyone. Party activities for kids are best to plan ahead of time so that the party can run smoothly and all the activities keep the children busy and amused. Whatever activity you choose – such as a hula-hoop party or a super heroes party – our kids activities for birthday parties section will provide you with many ways to ensure they are entirely engrossed in all the fun. All in all, party activities for kids gives them a great afternoon of fun. Children birthday party activities add that little bit extra to what could otherwise be a bland party. Games for kids birthday parties can be loads of fun for the kids. Any party with games will hold everyone’s attention as they all compete to win the prize! You can also decide between a kids indoor party game or for an outdoor pool party, a kid pool party game. Kids games for parties can add a whole new dimension to the afternoon, giving the children hours of fun and laughter. Ways to do this include kids birthday party game ideas or child birthday party games. Planning children’s party games indoors can be rather daunting but if organized properly, it can be lots of fun. Sand art, and many more exciting favors and decoration. When hosting a child’s birthday party you will need to stock up on party supplies. Kids birthday party supplies can include all sorts of costumes, favors, plates, cups, and the like, as well as kids birthday party decorations. There are a variety of shops who stock birthday party supplies for kids as well as party decorations ideas for kids. If you are having a child’s painting party, you will need to get kids painting party supplies. Other ideas can include kids tea party decorations, Halloween party supplies for kids, ice cream party supplies for kids, robot birthday party supplies for kids and mermaid party supplies for kids. Perhaps your son loves motorcycles – then you can buy kids motorcycle party supplies for a great afternoon of motorcycle fun. And what child doesn’t like pizza? Why not throw a pizza party with pizza party supplies. We have a list of possible party venues for you. Whatever theme you choose, there will be a Party Venue for you in Nassau or a Party Venue for you in Suffolk. A birthday party venue for kids can provide a great atmosphere of fun, excitement and mystery for your child’s party. Having your child’s party at any of the child’s party venues is easier than having it at home and ending up with all the set up and clean up. Checkout our comprehensive list of party venues for kids parties and you are sure to find one that suits your child. A children’s party venue can really be the answer to a successful party. There are numerous places for kids birthday parties in Nassau and Suffolk counties on Long Island. Instead of you going to all the trouble of setting up the party and then tidying up, you can pick a place to have your kids birthday parties and let them do all the work. Having your child’s party at child party places means you will not have to be worried about the noise or the mess. We have a varied list of kid birthday party places ranging from bounce house party places to spa party places to art party places and everything in-between. Our list of birthday party places for kids will provide you with plenty of party options to talk with your child about (unless it’s a surprise party). Party places for kids are designed for the kids to have maximum fun and for the parents to enjoy too. If you spend some time going through our list, you will get some new ideas about places for kid’s birthday parties, and find a birthday party place near you. Party rentals for kids can take all the stress and worry out of planning your party by placing it all into the kid’s birthday party rental staff’s hands. Sometimes a fun idea can be to hire a kids party bus rental for super fun and entertainment. Rentals for a kid’s party can turn an ordinary party into a great one just with a few things such as: a DJ, fun characters and a clown or two. As for the food from kid’s birthday party rentals, you can rent a candy floss machine, a popcorn making machine, snow cones and lots of other yummy things to eat. Kids will have the time of their lives and you can feel happy that you picked the right party rental company for your child’s party. Catering for a kid’s party can be a long, tiresome job if you do it yourself. But if you get someone to do it for you and hire a kid’s party catering company, you will have a much easier time and be able to talk with the other parents who also come to the party. Hiring a children’s party food catering company makes the whole day go much more smoothly so you don’t have to worry about it. There are plenty of companies that do children party catering. Look up one in our handy guide to find one that is close to you for your kids’ birthday party catering. Depending on the age of your child and the children attending the party, you can have finger foods for your child’s party food. It is so much easier for the little kids to eat finger foods such as chicken nuggets, mini pizzas, small slices of carrots or apples and other finger foods can all be put out as child party food choices. Kids party entertainers can bring a new exciting atmosphere to your child’s birthday party. A child party entertainer can take the form of many things, such as a clown, a person to twist balloon animals, a baby animals’ farmyard provider, dancers and singers. It is such fun for the birthday child to have a children party entertainer coming just for their party – it makes them feel so important for the day. Child party entertainment can be a sports clinic – hockey, baseball or motorcycles, while others might prefer a fairy party or a rock star or film star party with a magician for example. For your kids birthday party entertainers, you might book a puppet show or a face painter to come and entertain them, or a clown might perform as one of your party entertainers for kids. Whatever entertainer for kids party you decide on, we are sure your child’s party will be fantastic! Kids birthday party performers can liven up a dull day. A children’s party entertainer such as a costume character can make the difference between a fun, happy party and a boring, quiet party, and naturally you and your child will want an exciting fun party. To ensure availability of a specific children’s party entertainer be sure to book them well in advance of your child’s party. Need a Clown or a Princess for your little one, click on Party Entertainers and Performers category then on Clowns or Costume Characters. Maybe your little one wants a special dessert, click on Party Catering and Desserts, then Candy Buffet Tables. If you can imagine it then our LI Party Guide can help you achieve the perfect celebration. Let us help you start planning that Special Event today!